I had never read a comprehensive history of the American Revolution before this book, so it was definitely my introduction to many of the battles and sites I had always known were important, but maybe couldn't tell you exactly why: Lexington and Concord, the Battle of Bunker Hill, Valley Forge, Trenton, Saratoga, Yorktown, etc. 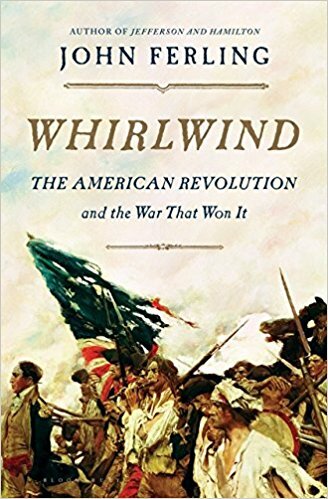 There are a great many widely praised, single-volume histories of the war, but I settled on John Ferling's Whirlwind mainly because it was well regarded but also available via Kindle through my local public library. I found Whirlwind to be absolutely mesmerizing. Ferling does a great job of walking the reader through the various events that led up to the Revolution (the Stamp Act, Intolerable Acts, Townsend Act, etc), but also provides detailed descriptions of the major battles. His chapters on Lexington and Concord and Bunker Hill put you right in the thick of things. I felt the weight of the moment when blood was finally shed and men on both sides of the conflict had been sacrificed. The book also includes fascinating and often overlooked details on the economic factors that led to colonial disenfranchisement as well as the perspective from England. Seeing the debates over the war on both sides of the Atlantic made it seem as complex and multi-faceted as any modern conflict. Washington comes in for praise of course, but also quite a bit of criticism. Ferling is often flabbergasted at the poor decisions made by both Washington and the Continental Army as well as British generals. It seems a good many inexplicable blunders were made by both sides that could have potentially turned the tide of the war. By the time Cornwallis surrendered at Yorktown, it seemed obvious why Washington and Hamilton were so in favor of a strong federal government in the lead up to the writing of the Constitution. The inability of the United States to consistently clothe or feed the army, organize state militias and arm their men left Washington too often dependent on the whims of individual states to form effective fighting militias. It seemed a wonder that the war was won at all, and it certainly could not have happened without the aid of the French and Spanish. All in all, a harrowing, highly readible, fascinating book.